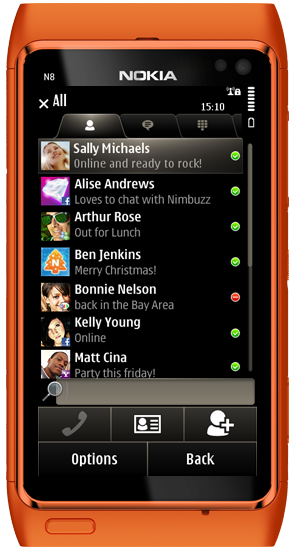 Stay in touch: Join your friends online. Whenever you have something on your mind. Show them your mood, presence, location or start communicating with them. Save Money: Instead of calling minutes, Nimbuzz uses the internet to let you make free international calls to your buddies. Friends or family not online…? No problem. Buy NimbuzzOut credits to call landlines and mobile phones against low rates. Saves you a lot of money on international calling! Locate your Friends: Share your location and retrieve the location of your buddies on a map. Great for arranging face to face meetings. Never lose your Contacts: Use the Phonebook to back up and restore your contacts. Contacts will be backed up online. Comes in handy when you have lost your mobile phone. Social networks & communities supported by Nimbuzz include Facebook®, Windows Live Messenger (MSN®), GoogleTalkTM, Twitter, Yahoo!TM, ICQ, AIM®, MySpace, Hyves and others. The best way to become More Mobile!